Woodchat Shrike: a common migrant through Gibraltar, particularly during the spring when birds are often observed sitting on tombstones at North Front Cemetery. Balearic Shearwater: This scarce bird only nests in the Balearic islands but regularly migrates past Gibraltar to and from the Atlantic. Some are nearly always to be seen off Europa Point and large movements sometimes occur. As with other shearwaters, the rapid wave-skimming flight is distinctive. Eagle Owl: A pair settled in Gibraltar to breed on the Rock’s cliffs during the mid 2000s and has remained in Gibraltar since. Our resident pair is present all year round. Razorbill: A succession of flocks of these migrants can often be seen from Europa Point, the birds passing in tight groups low over the water. The whirring flight is distinctive. A few individuals are often seen fishing inshore in winter, even in the harbour. Egyptian vulture - Small numbers occur regularly over Gibraltar in spring and autumn. Bred formerly. A couple of pairs nested on the Rock until the 1930s but no longer. Mediterranean Shag - A small breeding colony of 5-8 pairs of this threatened seabird breeds in sea caves along the east side of Rock. The Gibraltar colony is possibly the only one left on mainland Iberia. European Bee-eater - These very colourful, tropical-looking birds migrate past Gibraltar in some numbers during the spring and late summer. They breed mainly around the Mediterranean but also in central Europe. Hoopoe - The Hoopoe breeds throughout the Mediterranean and is known to many locals as ‘Gallito de Marzo’. They are particularly noticeable around the Alameda Gardens in March during its main migration period every spring. Bonelli’s Eagle - Formally resident in Gibraltar, it still breeds in Spain and young birds are sometimes seen on the Rock. It bred in here until the early 20th Century, its disappearance probably a result of the disturbance caused during the runway construction. Blue Rock Thrush: An attractive, large, bluish songbird which is a fairly common species on cliffs around Gibraltar throughout the whole year. It is sometimes also found on buildings and rooftops in town, especially during the winter. Lesser Kestrel: This small, endangered falcon breeds in Gibraltar and also migrates past the Rock, to and from its African wintering quarters. Ten to fifteen pairs breed on the cliffs at North Front. Their traditional feeding grounds in nearby Spain have all but disappeared and the Rock’s population is threatened with extinction. The 2008 Definitive replaces the 2004 ‘Flowers of Gibraltar’ Definitive. 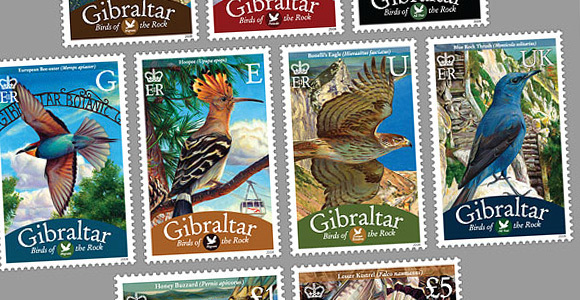 The issue is comprised of sheets of 50 with gutters (see images on this page) containing more extensive information on each bird and how it relates to Gibraltar. ‘Traffic lights’ used by printers to create accurate colours are included by request of collectors. Special thanks to GONHS (Gibraltar Ornithological and Natural History Society): Dr. John Cortes MBE, Charlie Perez, Keith Bensusan and Ernest Garcia for their invaluable help with the issue.